I am Tracey, now 37. My daughter Eva is now 3.8yrs. I have always had a perfectionistic personality, and liked things to be in control and orderly. These traits worked in my favour in my work life, however, I believe they contributed to my (so called) failures in Motherhood, along with (so called) failed breastfeeding and fear of judgement and criticism from others. My PNDA nightmare began within hours/a day or so of giving birth. My racing mind led to 5 straight days without a wink of sleep, to the point I was unable to sleep. Some mild psychosis took over, and I just wanted to run and hide, to get away from this new stranger (my baby) that depended on me for life. I was scared stiff, as I felt I was losing my mind and surely couldn’t be responsible for another living being when I easily could have ended my own life had I not had the most supportive and kind family reassuring me that I was going to be alright. Medication certainly helped to a degree, and when my daughter was 10 months, I tapered off the med, and within a month I had relapsed right back to where it all started, only much worse this time. Being hospitalised for 3 weeks was scary, heartbreaking, humiliating, but a blessing in disguise. The mental health nurses, my Psychologist and Psychiatrist looking after me were my saviours. They saw the good person within, when I was convinced she had gone. I would sit with them and ask how I could possibly recover from this? I will forever be in debt to a nurse called ‘Sisi’ who explained it metaphorically to me like this… “Tracey, we can buy your ticket to the destination, we can pack your bags, we can drive you to the station, but THE JOURNEY IS YOURS TO WALK!”. Those words spoke volumes to me, and I was determined to listen and act. I knew that she meant I would have to do the hard yards, follow their advice, and put the skills I learnt during my time there into action. Several different meds were tried before finding my matches. I completed (and lived) an Acceptance & Commitment Therapy Program as an outpatient. I was also put in touch with Peach Tree, and the group of amazing, gentle and kind ladies that have supported me on this journey. 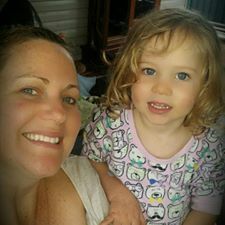 It took until Eva turned 2 before something ‘clicked’, and I felt ‘different’, ‘better’, finally ‘in love’ with my daughter. I am almost off my final med, now pregnant with #2, back working full-time with my long term Employer, and living the dream I never thought possible. My goal now is to help others along their journey, and Peach Tree is an important part of that.